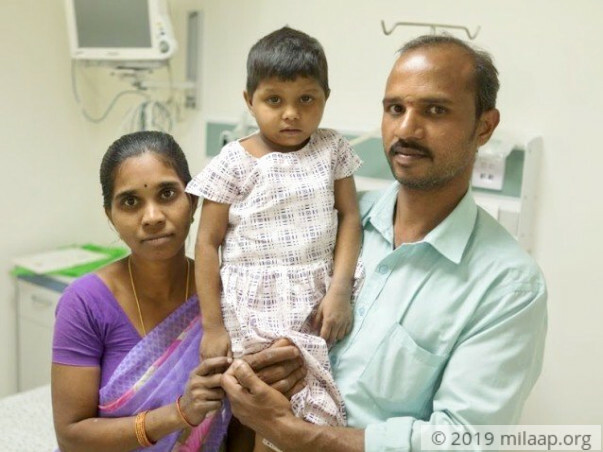 Geetha, the 5-year-old daughter of Paramesh and Jyothi was 2 years old when she got jaundice for the first time. Her stomach was swollen and she couldn’t eat properly. Gradually within a year, her stomach started hurting and Geetha started compulsively itching her skin. When her parents took her to the doctor, they diagnosed her with a serious liver condition which only a liver transplant can cure. Paramesh and Jyothi are parents to 4 children, Vinay, Meenakshi, and twins Geetha and Gayathri. 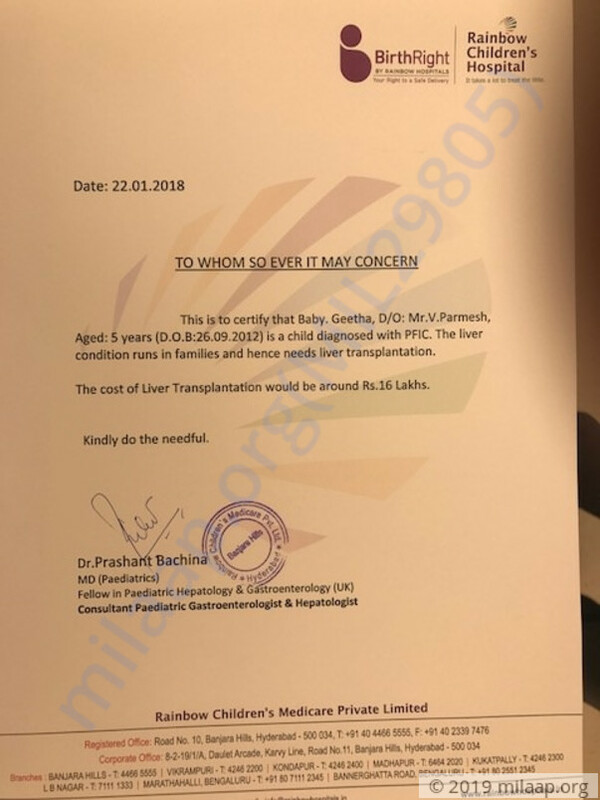 Unfortunately for his family, except Vinay all the other children have been diagnosed with PFIC (Progressive Familial Intrahepatic Cholestasis), a chronic liver disease that turns into cirrhosis. The only way to permanently cure this illness is through a liver transplant. All of Paramesh’s daughter suffer from bloated stomachs and itching because of this condition, but Geetha’s condition is the most critical of them all. Due to their illness, the little girls can’t sleep at night and keep scratching their skin all the time. Little Geetha suffers so much that more often than not, her skin starts peeling off and bleeding because of all the scratching. Unable to help them in any way, their parents also have to scratch them until they’re finally able to fall asleep. By the time they sleep, it’s usually 4 in the morning and on then Paramesh and Jyothi get to enjoy a wink of sleep. But owing to all this, Paramesh’s work gets affected, and sometimes due to lack of sleep, he can’t go to work at all. Despite their illness, all the children play with each other quite a lot. It’s when they try to sleep, the real nightmare starts. Their skin starts feeling irritable and Paramesh and Jyothi can’t help but stay up all night to make their little girls feel better. For Jyothi and Paramesh, parenthood has turned into a scary nightmare where every day is a struggle to put the kids to sleep. They feel helpless at their children’s condition, especially Geetha’s who writhes in pain and cries out from itchy skin. Every father wants to give his children a healthy and good life. For Paramesh, this is a herculean task since three of kids are battling this chronic disease. He works as a mason for a meagre salary that doesn’t let him afford this expensive treatment. His pleas for different relief funds have been rejected, and his relatives are not willing to help him out in the time of need. Despite all the odds being against them, Paramesh and Jyothi are trying very hard to give Geetha, the treatment she needs. But their hope solely rests on your help. Your contribution can save Geetha from a terribly painful fate and give her a fair chance at life. Geetha is now doing okay and is at home. The doctors have advised her to be on medication for now. The pre-transplant tests were done to identify a potential donor and I (the father) seem to be a good match for my daughter's transplant. The date of the surgery hasn't been decided yet. We are all hopeful about her recovery. Please keep praying for her. We shall keep you posted on further developments. Geeta is stable on medication and is due for next review in the coming week. We would mostly plan transplant after reviewing her and the organ donor, we hope to do the transplant by end of this month. 31 Jan 2018 Banjara Hills, Hyderabad.